This is a great product made well with good material love it. I love the colors because i can turn it over for a different look. I recommend this product. Keep warm all year round with the Amrapur Overseas All-season Reversible Down Alternative Comforter. This comforter features a polyester construction with hypoallergenic down alternative fill. With a reversible design and a variety of attractive color options, this comforter is a must have for your home. Dimensions 23.0 In. X 17.0 In. X 4.0 In. Color is true to image. Very warm and comfortable. My only complaint is that I bought a king size for my queen size bed because I like comforters to be long enough as well as wide enough so that when you're under the covers the side of the comforter does not come up short. I like the side to hang long enough so that there's no air gap, so that the comforter still reaches past the top edge of the mattress. This comforter is long enough for my queen bed in one direction only. It is definitely not a king size ! I had to choose between it being long enough on the sides of the bed or long enough on the length of the bed. I chose the sides, so the result is that it only goes past the foot of the bed by a couple of inches........It's more like a full size. This is a blanket. But not just any blanket. Most blankets keep you warm. This blanket transcends mere warmth to—"perfectly toasty." It's not too heavy, nor too light. If I was a marshmallow, I'd be golden brown after sleeping under this blanket. At first, I thought it seemed a bit light, like it wouldn't be warm enough. Wrong. It's perfect. (I live in Georgia, but it gets surprisingly cold—and I'm from Colorado. This blanket is the perfect amount of warmth for Georgia winter.) I got the cinnamon color. How many blankets do you know that are cinnamon colored? At least mine, that's how many. Color is awesome, matches the photos. Ultimately, this blanket does blanket things. I'm very happy with my purchase. I got this comforter in the mail yesterday. Once I got it out of the package and on my bed, I was kind of disapointed that it wasn't as fluffy as I wanted it to be. I'm a huge fan of big fluffy comforters, but they tend to me really heavy. This comforter is VERY light! After sleeping with it last night, I am very impressed. I live in Maine, so it's pretty cold at night this time of year. It kept me warm all night! It's super comfy too and so soft. This is a great buy! I absolutely LOVE the colors - I got the teal and the anemone and they are rich and vibrant - the reverse neutrals are what they are but those colors -- WOW. They are a bit short so I strongly recommend up sizing if you want coverage over the bottom of your bed. I got both in queen and I don't care that they aren't long enough no need to return them. However I just added two more that I will order Wednesday - another teal and rust (cinnamon?) whatever they are calling orange, in a KING size. These are not thick, plump comforters but are plenty warm - I am very cold natured but have to have summer AC because I have dogs who wear fur year round - so of course I freeze at night and these are a perfect summer weight - I have no reason at all to think they won't be warm enough in winter (but just in case I'll have plenty on hand to double up if necessary). Because they are light weight AND warm AND gorgeous AND at an unbeatable price, I'm not deducting any points for them being somewhat shorter than expected (that might also be due to how thick my mattress and box springs are). Easy recommending these - for weather purposes I am in Atlanta GA so hot, sticky, humid, miserable summers and cold crisp winters. I love this Amrapur Overseas All-Season Reversible Down Alternative Comforter. It is beautiful, and not heavy. It can either be folded down at night, or used to cover-up. It is a wonderful feeling comforter. I would definitely recommend this to all friends and family. I also would purchase another one! I love the fact that is is reversible! Get a spot on one side, turn it over!! With grandkids that is a plus!! This is my 5th one of these comforters. I ordered the white on white and white on gray. I've had many of the silver on black as well. I love the comfort of the "downless" and the "hand" or feel is super soft. It's like wrapping yourself up at night in total cozzyness. ALL of beds have these! I even have one as a throw in twin size for the couch. The "oversize" is nice because you never have to worry about shrinkage or the comforter feeling or looking too small for the bed. This keeps you warm in the winter and definitely cool in the summer. My family loves these. MUST HAVE. I love the reverse look idea as well as the pop of color of you turn down the top when you make your beds. HIGHLY RECOMMEND! The comforter is warm enough for spring, summer, and early fall; it is thin and lightweight and consequently does not weigh much, which is nice. I used with a heavy blanket in winter. The white is bright white. The queen size fits a queen bed with a few inches on both sides. This is great all season comforter. The reversable feature gives a whole new look to your bedroom. I would recommend this as it's a very nice quality comforter. This product is soft nice looking and can keep you warm. I got the gray-white. However it's very thin, and it doesn't hang over each side of bed but maybe 2 inches, the picture is deceiving. I'm not sure how well it will hold up after being washed. Very pleased with pretty color, it's lightweight and comfortable at night. I suffer from hot flashes and this is a perfect alternative to a big, fluffy down comforter. Nice feel to the cloth and holding up nicely to multiple washings. LOVE it & it's fits into the washer! 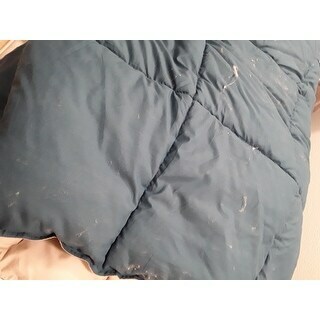 My husband and I have been in love with a white Calvin Klein comforter that we picked up a few years back, but overtime it had faded, and I didn't want to shell out the cost for a new one. I also really wanted something that would fit in our top load washer so I didn't have to pay a dry cleaner every time we wanted to wash it. This comforter is PERFECT! It fits in the wash and is super soft! We live in Florida where it is really hot out right now, and the comforter is light, and we couldn't be happier with it. We also have four kids, and it's nice to know that if something accidently got spilled on it, it wouldn't be a big deal to replace it cost wise. Great price, great quality, buy it now! My husband and I both love this comforter because it is perfect for year round. It is not to heavy or light. It is just comfortable. It is fall now in Michigan and we can see lays on you like a "cloud"
I bought this for my son who was away in Idaho serving a Mission. He liked it and said it was very comfortable and he was cozy at night. It has been washed several times and has held up though several washings. So far so good! I got this today. The fill was starting to come through the fabric. I decided to was the comforter, to refresh it. I used the gentle cycle, cold water, and dried it on low. What a fluffy mess! Fluff ( down alternative filling) everywhere. Worst quality ever. I threw out the packaging, so I am stuck with it. Perfect bed cover. Comforter is fantastic! This comforter is fantastic- it is extremely soft and large enough to cover our king-size bed very well. Will definitely purchase others for our guest rooms. It is Perfect no matter the temp. This a very versatile comforter. Bought for an 18 year old to dress up his bedroom. Good quality and price. Excellent addition to teenager’s bedroom. These are nice and lightweight, which is one thing I was specifically looking for. I will say, though, that they are super wrinkly, especially at first. Love my down blanket! It was delivered vacuum sealed. It’s so soft! Perfect for year round comfort! Washed up very well & made it even softer. So far so good. I've had this product for a couple of months now and it seems to be holding up well. Has even made it through a couple of wash cycles without any problems. I love my comforter. It's is beautiful and tied my bedroom together. I won't sleep with any other comforter. Thanks Overstock. Yes, the outside is polyester. Overstock says yes but personally it feels like microfiber.... is a great comforter for the price. I purchased Q oatmeal and blue. Lightweight but warm and fits a Q bed so both sides are covered to the box spring. Stains come out easily tpo (4yo son) and has held up to multiple washes. "The blush Comforter more of a peach color?" "Is this comforter made of microfiber on the exterior?" Yes both sides are microfiber which in part makes it all-season. "Is this comforter fire resistant?" why should it be? Frankly, I haven't tried setting it on fire. "What are the measurements of the king. Still confused "
"What is the difference between Queen and Full Queen Size? Thanks, jasmine"
A queen size is aprox. 7 inches wider and 5 inches longer than a full size, not sure if this answers your question. I have a double bed but get a Queen size comforter because I like it to hang over the sides more. I use to have a Queen bed and got King comforters. It depends on how you like the cover to fit your bed. I have a dust ruffle and it looks great with the over hang. The difference between Full Size (double size) and Queen is about 6" I believe. "Is the maroon color more cinnamon brown? Or more maroon/burgundy? Also, has will the king size duvet set be big enough to hang extra over for a queen bed?" I'm sorry but did not get the maroon comforter so unable to answer question . The one I got was sea green and just so lovely. If you mean the Anemone/Wheat it is a much lighter red than the photo, almost a pink.